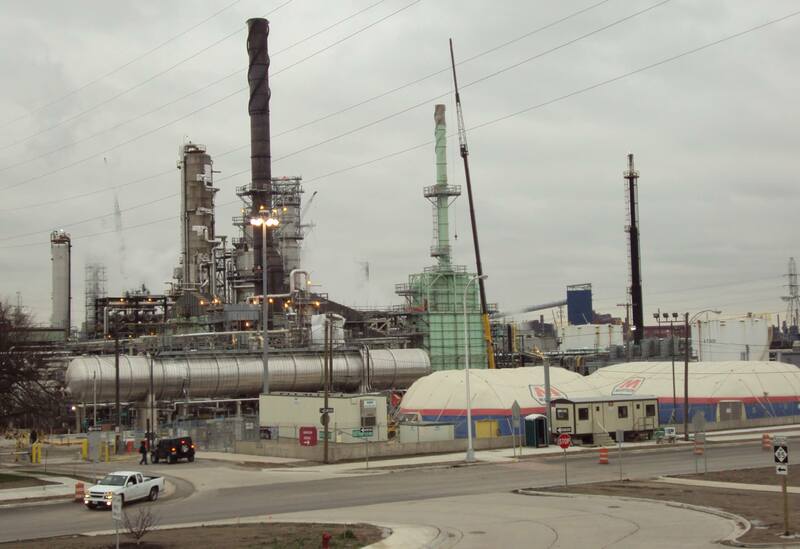 A pungent rotten-egg smell originated from the Marathon Petroleum refinery in southwest Detroit, the Department of Environmental Quality (DEQ) discovered this weekend. The DEQ caught wind of the odors on Saturday and promptly investigated the issue, according to a department press release. State officials traced the smell to a refinery coke-flare system and said that Marathon is “taking steps to mitigate” it. The foul stench was caused by hydrogen sulfide and mercaptan compounds ignited in the flare, according to the DEQ. “Both of these compounds have a strong rotten-egg smell that can be noticed at extremely low levels,” said Mary Ann Dolehanty, director of the DEQ’s air quality division. But aside from the smell, the odors are not a cause for concern, she said. Kheiry apologized to southwest Detroit residents and said the company is still investigating the issue and taking air samples. Marathon is also looking at “short-term options” to eliminate the odor and will halt the flare system for repairs, according to DEQ spokesman Scott Deans. That could take days, however. The DEQ didn’t find the odor downwind in Oakland Heights and “did not detect elevated levels of concern” that exceed state health standards, Dolehanty said.